I don’t know Alexis Tioseco. I wish I met him in person and say he was my friend and reminisce our discussions. But I can’t. I never got the chance. The first time I took notice of his name was after I heard the news on facebook about his death. I googled his name online. There I discovered his works, his writings, and his thoughts – each article giving me some idea on who is Alexis Tioseco. After that, I realized that I have encountered him before. All this time, I have read his works but never took notice of it. I remembered discovering the website Criticine around 2005; I saw his name as the sites founder and thought nothing of it. I was fresh off film school and just wanted to figure out how I can get my career going. As a Filipino filmmaker living in Vancouver, Canada, I yearned to go back to the Philippines and see if I can get my break there. Through Criticine, I learned about the Philippine “indie” film movement and the Filipino filmmakers spearheading that movement. I found the website a great resource on learning more about Philippine Cinema. There was one article that struck me; it was the one where Raya Martin wrote a journal of his stay at the Cannes Cinefondation residence. Fast forward to 2009; one of the things I discovered online after googling Alexis Tioseco is his Multiply blog. There among the albums, were pictures of him and John Torres attending the Vancouver International Film Festival (VIFF). It was 2006 and that was the year John Torres’ film “Todo Todo Teros” won the Dragons and Tigers Award. I was disappointed that of all the years I decided to skip VIFF, it was that year. All I can do now is wonder; what if I attended? Will we strike up a conversation and hit it off? Who knows? But alas, it’s neither here nor there in the grand scheme of things. It’s weird how we only take notice of a person’s importance once they are dead. We never notice someone’s contributions or achievements or pay close attention to their work until it’s too late. It’s unfortunate that Alexis had to die before people started listening to what he was saying. As I learned more about Alexis and his passions, I was overcome with sadness of his loss; especially the tragedy of it all. But what makes his death mournful is the idea of how much he could have contributed into improving not only Philippine Cinema but also to the Philippines if he hadn’t died. Alexis was on to something with his work of promoting and publicizing works of various Filipino filmmakers. Sometimes people don’t pay attention or appreciate existing works until someone points them to it. He saw that he didn’t need to be a filmmaker to make a difference when he can contribute by helping to make their work known. Almost 2 years has passed since his death and there are people who still commemorate his work and life. One of his lasting impacts was his writings strewn all across the internet; his voice forever reminding us of what is possible and what changes that needs to be done. This is where we are now, remembering the person and being inspired by his thoughts. Inspired in the same way Jose Rizal’s 2 books, “Noli Me Tangere” and “El Filibusterismo” lit a fire in the hearts of Filipinos to rise up against the Spaniards. Maybe Alexis’ writings may also do the same thing to the hearts of Filipino filmmakers and moviegoers. It sounds dramatic but author Napoleon Hill once said, “All achievement, all earned riches, have their beginning in an idea.” Sometimes an idea can have the power to initiate change. One of Alexis Tioseco’s articles titled “Wishful Thinking for Philippine Cinema” could be that match that ignites and inspires change in Philippine Cinema. It is an article where he pours everything he had into what he sees Philippine cinema needs in order to reach new and greater heights. It is a long list. I counted 91 wishes in total, give or take a couple of wishes. Not to mention the handful of times he hopes, cries, and mourns something that affects the state of Philippine cinema. From what I gathered from the list; Alexis is an optimist. You cannot have that much passion by being cynical. I think cynicism easily flows in the hearts of Filipinos like rain during the wet season. And when it rains in the Philippines, it pours; to the point where it can flood the streets and even reach disastrous levels. 350 years of colonialism and the constant rule of the oligarchy and the rich; combined with the majority of the population’s propensity to get ahead by any means necessary breeds that kind of attitude into you. Filipinos have a hard time giving someone the benefit of the doubt; even if that person comes with good intentions and has a pure of heart. Who is this foreigner? What is this kid’s agenda? Why should I listen to his opinions? I bet some people lobbed these questions behind Alexis’ back. That’s one thing you can guarantee in a Filipino; we very, very rarely insult someone in their face. Plus Filipinos are very sensitive when it comes to criticism. We lack the ability to self-reflect and self-criticize. We can notoriously bemoan hours on end the problems of the Philippines and we are quick to blame others for our country’s failures, even going so far as blaming the government for the problems in our own lives. But rarely does a Filipino come to see the blame in oneself. I think that’s what a critic does, they criticize and reflect. They polish themselves to an impeccable shine to act as mirrors so that we can see what needs to be fixed and celebrate what is good. A true critic would spend their entire life striving to reach this unattainable state. Maybe it explains why he only focused on the positives in his film criticisms and only gave his time to exposing films that would never be given a chance by the audience. He was known to champion the exposure of Filipino independent films and filmmakers. He made every effort to give them international exposure for he knew that Filipinos don’t appreciate their own until someone from another country appreciates them first. Alexis incessantly wrote to international film festivals and film critics asking them to check out films of Filipino filmmakers. He championed the discovery, exhibition, restoration, and preservation of Filipino films. It was one of his major wishes. Slowly his efforts started to gain momentum; some film festivals started showing Filipino films; international critics started writing about movies being made by Filipino filmmakers and in turn Filipino filmmakers and Philippine Cinema are now REGULARLY being recognized globally. As a result it has now become common place to see Filipino films and filmmakers show their work on international film festivals and in some cases have lead to international collaborations and co-productions. In fact international film festival programmers regularly include the Philippines as among the countries they check out when looking for films to put into their festival. It has also created a boom in Philippine Cinema where there are now new kinds of movies and new types of stories being made regularly because filmmakers see that they can showcase their work internationally and not just rely on the local Philippine audience. Filipino filmmakers started to take notice that Alexis was for real. They saw his sincerity, his passion, determination and enthusiasm for Philippine Cinema. When I read what he has done and his strong convictions, I felt ashamed that I was doing nothing and envious of what he has done. At one point I exclaimed, “Is this guy for real? This guy is like at the level of Ninoy Aquino or Jose Rizal in terms of love for his country and dedication to his cause.” One cannot help themselves but be inspired. The internet granted him the avenue to freely express his views and opinions. Now a new generation of Filipino film critics and film bloggers are following in his cyber footsteps. Today, 2 years after his death, I come to reflect on one of his most hopeful and yet direct articles, “Wishful Thinking for Philippine Cinema”. It is an article that clearly comes from a man who sees so much possibility for change and improvement and yet the harsh fact of reality slaps him into frustration that he snaps, “enough is enough!” He calls out the blight and sheds light on what needs to be done. Actor and Director, José Ferrer, once said “A man when he wishes is a master of his fate”. Maybe by wishing these things Alexis is mastering his fate. By writing down his wishes for Philippine Cinema, it is his way of moving on from wasting time and energy in explaining why we don’t have what we want and instead we should focus on pursuing other ways to get it. It’s like writing a New Year’s resolution; before you can start becoming better, you need to first figure out what you desire. By writing it down, you can objectively judge what you want and then make the necessary steps into achieving it. There is nothing wrong with wishing, especially for something good. It means you haven’t given up. Upon a closer read, most of the wishes and points that Alexis mentioned on his article are actually doable. Frankly, it all starts with money. Money turns the world. That is a cold hard fact in life. It can easily turn any dream into a reality. I bet everyone at one point in their lives have thought of what they wanted to do and every single time the missing piece to making it all work somehow involves “MONEY”. I wish to make a movie; I wish to go to school; I wish to travel and see the world; I wish to take care of my family; I wish to live comfortably; I wish to change the world; you can go on and on but unfortunately it all depends if you have the money. It sounds cynical but the reality is; everything that we do or want to do will somehow involve the use of money. The main points that Alexis’ wished for was the cataloging, restoration, and preservation of Philippine cinema for future generations. Items like infrastructures in the form of a “film museum” and a “Philippine Cinematheque” and a film library and upgrading the UP Film Centre or the publication of books on subjects ranging from a book on all Mowelfund short films; to a book about Philippine posters; to more books about Philippine cinema; to Noel Vera finishing his book on filmmaker Mario O’Hara; to a book publishing screenplays of classic Filipino films; to Nick De Ocampo finishing his book on the history of Philippine cinema; to even the re-publication of books written by Hammy Sotto and the Manunuri Books on Philippine Cinema of the 70’s and 80’s; or the creation of a regular film journal; or the proper releasing of DVDs (similar to the care and attention given on Criterion Collection DVDs) of all the Mowelfund short films and classic Filipino movies are all proposals that would address his main points. On his wish list, he also looked into addressing the development and growth of Philippine cinema by providing funding to filmmakers like Lav Diaz, Raymond Red, Mike de Leon, Cesar Hernando, Rox Lee, RA Rivera, and Khavn dela Cruz so that they can freely pursue their respective projects. It doesn’t take a genius to figure out that it takes a lot of money to make these projects and wishes possible. The problem is that the Philippine government does not have the money nor consider it a priority to fund these projects. So the next place to look for funding is the private sector. Unfortunately no one has stepped up. Maybe it is the reason why Alexis also wished that the following individuals who are in a position of power, wealth and influence in Philippine Cinema should all do better and change their practices. People like Mother Lily, Vic Del Rosario, Nestor Torre, Robbie Tan, Quark Henares and also organizations and production companies like the Movie Television Review and Classification Board (MTRCB), Film Development Council of the Philippines, Metro Manila Film Festival, Star Cinema, Cine Filipino, Cinemanila, Cinemalaya, Cinemaone, and FPJ Productions. Alexis mentions in his wishlist how, “Cinemalaya, which, thanks to the media and the government’s press mileage behind it, has a great festive excitement, would actually put their efforts in the service of Philippine cinema, and not their own self-involved attempt to start a micro-industry” and “Cinema One, which takes more risks, gives more money and often produces better films than Cinemalaya, would actually give filmmakers some rights to their work and stop swindling them”. But what’s the use of someone stepping up for Philippine Cinema if the filmmakers don’t follow suit. It’s probably why Alexis also wished that filmmakers should not sell out and should have some integrity to tell people and studios like Viva Films to “screw themselves when offered another exploitation film” and to “stop listening to Robbie Tan”. We should expect more from Philippine Cinema and part of what is needed for that to happen is for filmmakers to start being confident with their own voices. There is a part in the wishlist where Alexis reminds filmmakers and film critics that it’s time to move on from the glory days of the past. 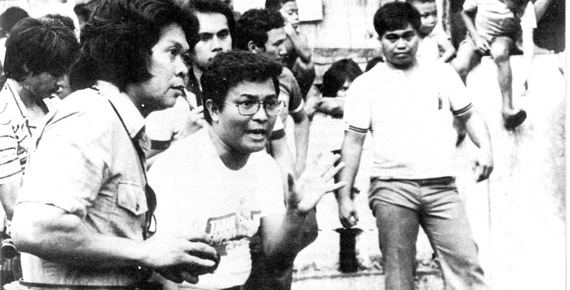 Alexis wished that “older commentators would understand: Lino Brocka is dead” and that “younger filmmakers would understand: Lino Brocka compromised when he had to because he had to, and perhaps even, at times, too much. You are living in a different time. The excuse that Brocka made more than 60 films therefore you can afford your own mediocre ones does not hold water”. After all these wishing, Alexis still had it in him to wish for success and more opportunities given to people involved in Philippine Cinema; especially to Lourd de Veyra, Tad Ermitanio, Teddy Co, Raymond Lee, actors Elijah Castillo and Ketchup Eusebio, film critics Francis Cruz, Richard Bolisay and Dodo Dayao. As much as he was quick to criticize and point out what needs to be improved, he is also equally quick to give praise and support to those that do well in improving Philippine cinema. I think that’s how Alexis Tioseco should be remembered. As someone who saw the good and the potential in people. That he believed that Philippine cinema can stand shoulder to shoulder with the rest of the world. I don’t know if Alexis meant for people to talk about his wishlist the way it’s being talked about now. It is hard to comprehend why Alexis was given such a tragic fate. I don’t think he ever anticipated that by dying people will start paying attention to his works and wishes for Philippine Cinema. But that’s what happened; Alexis Tioseco died a senseless death and people only started paying attention to what he was advocating after he died. I am ashamed to say it but that’s how I ended up knowing Alexis Tioseco. In my research writing this essay, one thing is undeniably clear about Alexis Tioseco, he lived a life pursuing his passions. It’s hard to exactly measure how much his life made an impact to Philippine Cinema. I think the best way to measure the impact of Alexis Tioseco’s life is to see the actions of the people he inspired.